Lily's Ink Pad: Stampin' Up! Fun Here I Come! As you know, I love swapping, especially with demonstrators. I received this cute little bookmark on the right at Leadership and recreated it for my stamp groups in March. I made a new version for the regional to swap that you will see later! Accessories: Big Shot, Two Tags Bigz Die, Scallop Circle Punch, 1 3/8 Circle Punch, Ribbon, Silver Brads, Paper piercing tool, Matte Pack. These are so easy, yet so cute! Simply stamp your critter. Punch out with circle punch. Glue onto a scallop. Cut out the Tag using the Big Shot. Fold Ribbon in half. Pierce ribbon, scallop, and tag with piercing tool. Slide in brad and open ends on back side. Ta Dah! 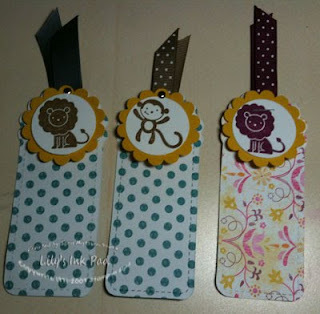 An easy book mark!